Before joining UPMC, my work history consisted of mostly retail jobs. My goal was to find a career that was long-term and had plenty of opportunities for growth. Both my mother and my sister are current UPMC employees, so I’ve always known that it’s a great company to work for. Beyond that, I could see the potential for growth in the patient access role, and it seemed like a really good opportunity. My goal was to find a career that was long-term and had plenty of opportunities for growth. Coming from a retail background, the transition was a bit jarring at first. Patient care is an entirely different level of customer service. The actions that you take can have a direct effect on someone’s health, so there’s more at stake than a simple retail transaction. You need to keep in mind that guests in the hospital are in a stressful situation, and you need to go above and beyond to meet their needs 100% of the time. The emergency room environment where I started out could be very fast-paced at times, but it was always an exciting experience. I always felt a connection with the patients and knew that I was making a difference. I always felt a connection with the patients and knew I was making a difference. I’ve been with UPMC for about four years, and I’ve been able to take advantage of several promotional opportunities along the way. I’ve certainly put in my hard work, but I’ve also been fortunate to have good supervisors and managers who have helped guide me to the next level. My current role involves supervising patient access employees at a variety of UPMC hospitals. Since I used to work directly in hospital environments, my experience definitely gives me a better insight into the day-to-day challenges that they face. I’ve been fortunate to have good supervisors and managers who have helped guide me to the next level. In my current role, our goal is to make the hospital experience more pleasant and efficient for patients, and I’m excited about a number of staffing and registration initiatives within our department. On a daily basis, I work with a variety of UPMC departments, and we all coordinate to get the work done. One challenging part of my job is managing a mobile team of employees. My 35 staff members travel to different hospital sites every day, and I communicate with them primarily through email and phone calls. Open communication is vital to ensure that the needs of the staff are always being met. As for the future? My goal is to simply continue my progress with UPMC and to take on additional management and leadership duties as I gain experience. Matthew isn’t the only one who’s shared his story about the possibilities of a patient access representative role. 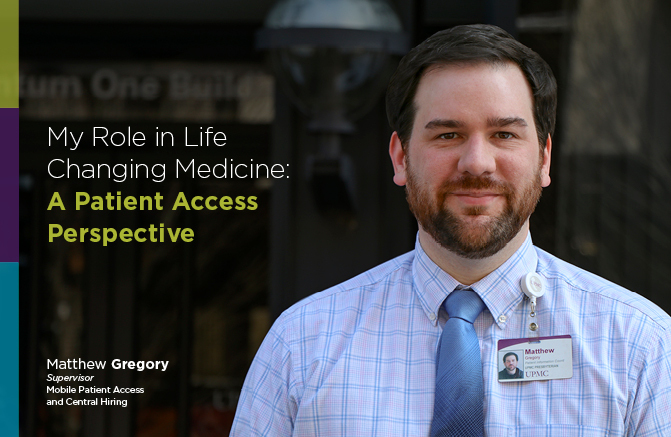 Read more from our patient access representative series and hear from others who know firsthand how a rewarding career awaits you at UPMC!